Andy and Napoleon would be proud. When Ampere Computing emerged from its quiet (and private) gestation, with Renee James as its chairman and CEO, I couldn’t help but smile. The boldness of the venture is striking. The stealth of the preparation was impressive. And the implications for computing and leadership are intriguing. It’s bold to launch a new company making silicon—high-performance processors for (as Ampere announced) compute, storage and other cloud needs. Chips are hard and the competition is fierce. Renee played down any competition with Intel, a company she grew up in and helped lead for many years. But I doubt anyone is confused: Intel will be in the mix as Ampere pursues customers, revenue and bragging rights in the new computing universe. It’s impressive that the company was unknown to most of the world until it was introduced this week. Renee is well known, her executive team is an A-list, and this market space is hot. So a bunch of folks did a great job of keeping a secret. In an age of so-called transparency, this is a nice reminder of the power of privacy: it lets you get your act together without noise, intrusion and distraction. Plus, gifts should be a surprise—and Ampere feels to me like a gift to computing and to leadership. It’s intriguing to consider the implications of Ampere’s creation for computing and leadership. The cloud and data center—the stated targets for Ampere’s processors—are essential to the computing universe we live in now. Those servers are far more than simple plumbing, instead making a growing difference in user experience and business innovation. And though we didn’t hear much about artificial intelligence in Ampere’s news coverage, I’m confident that AI is baked into Renee’s thinking and Ampere’s strategy. 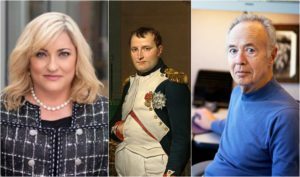 Strategic thinking is one of the many bright spots in Renee’s resume, which is why, when I smiled to read of Ampere’s birth, I thought of Intel’s former CEO and chairman, the late Andy Grove…and I thought of Napoleon. Renee was one of the humans lucky (and unlucky) enough to serve as Andy’s technical assistant, a role that combined the tasks of chief-of-staff, speech writer, intellectual debater, and student-teacher for one of the world’s most demanding and curious strategists. Andy loved boldness, I believe, because he saw no merit in meekness. I can imagine Andy telling Renee: Nice work creating Ampere. Now let’s see what you can do with it. Renee will be seeing, all right, in the way that Napoleon supposedly approached major battles: “We engage, and then we see.” (This we learned from Robert Burgelman, the renowned Stanford professor and Grove collaborator, in his book Strategy is Destiny*). Though it wasn’t the headline of the Ampere news, it is also noteworthy that this new silicon company was forged by a woman, who will lead its explorations and battles—its engagements—in the new computing frontier. It’s obvious that Renee is a role-model for women leaders. But the nature of this effort—the boldness of Ampere’s aspirations, the surprise of its emergence, and the immediate depth of its talent and technical readiness—reminds us that Renee is an example for all leaders. It’s a new world she’s engaging in—and a new world she’s helping to create. Next Next post: In any transformation, a question: How to get buy-in—and thrive?